Modern is a gigantic format. There are a shade fewer than 10,000 cards legal, which leads to a very wide variety of decks and strategies. Your opponent could be trying to burn you with Lava Spike, assemble all three Urza lands for a turn-three Karn Liberated, attack you for 10 points of infect, or control the game with Snapcaster Mage—and that's just scratching the surface. 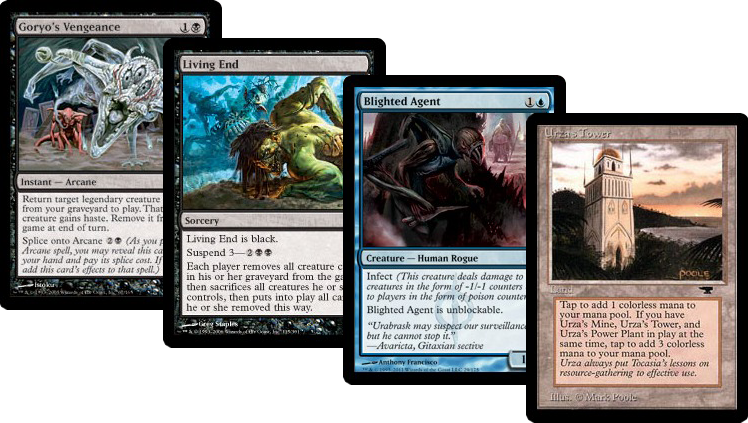 Today I'm going to look at the different categories of Modern decks and break down some selections from each category. That will give you a preview of what you might see at the Pro Tour, and maybe provide some inspiration for your next Modern deck. Speed (by which turn the deck wins)—Aggro and combo decks do have a goldfish turn, which is their average kill speed. Control decks don't, since they tend to win well after they've gained control. Interactivity (low, medium, high)—Combo decks tend to be on the low end of the spectrum, with control decks universally get a high rating here. Most decks fall into the middle. Resilience (low, medium, high)—How much disruption can the deck beat? The more resilience, the less speed as a general rule. One of the main differences between Modern and Standard is how prevalent Combo is. There are a ton of potential combinations in such a large card pool, and the best of these combinations lead to some of Modern's best decks. Combo decks take advantage of the size of the format—not only do they not have to worry much about what they are facing, they hope that the opponent won't be packing the correct hate cards. Let's take a look at one of the best combo decks in the format. Despite Infect being a deck composed of small creatures and pump spells, it's way more of a combo deck than an aggro deck. Blighted Agent and Inkmoth Nexus are good at avoiding blockers, and as a result the interactivity found in most creature decks isn't particularly prevalent here. The deck can win as early as turn two if it plays Mutagenic Growth, though turn three is much more realistic. Between Groundswell, Might of Old Krosa, and Become Immense, this deck presents one of the fastest clocks in the format. Very few cards in this deck can stop the opponent from carrying out their game plan. The exception is if the opponent is trying to kill Infect's creatures, because all the pump spells and Apostle's Blessing lead to some very relevant interaction. This deck can sideboard into a more interactive plan, because it's not the kind of combo deck that needs every single piece to stay in the deck. The biggest point of weakness is that the deck doesn't do a ton if it doesn't have an infect creature. It also can only win the game through combat, so something like Ensnaring Bridge or Melira, Sylvok Outcast is problematic. Still, the pieces here are so mix-and-match that it's hard for the deck to fizzle. Any of its creatures and any pump spells work, and cards such as Inkmoth Nexus and Pendelhaven let the deck play around removal very effectively. Infect is one of the best decks, and I expect to see a lot of it in the upcoming Modern season. This is the most recent list played by Hall of Famer Kenji Tsumura on Magic Online, and it's slightly different than the Borborygmos/Nourishing Shoal version. Excuse me, the Borborygmos Enraged/Nourishing Shoal Version. Still, the main game plan is the same: get a gigantic monster into the graveyard and cast Goryo's Vengeance, or get one into your hand and cast Through the Breach. Vengeance being an instant lets you discard Emrakul and put it into play as a response to the reshuffle trigger. Because this needs more specific pieces than Infect, it's about a half-turn slower. It can go off turn two with an optimal draw, which involves Simian Spirit Guide, but turn three or four is more realistic. Izzet Charm pulls double duty here, acting as a discard outlet and a way to kill a creature or counter a spell. Add that to the Spell Pierces and Remand and you have one of the most interactive combo decks in the format. All the looting cards and Jaces make this deck good at finding backup copies of its combo pieces. It is vulnerable to graveyard hate, but counterspells and card draw help you resist even the harshest disruption. Urzatron—Assemble Urza's Tower, Urza's Power Plant, and Urza's Mine, and cast Karn Liberated or Ugin, the Spirit Dragon. Living End—Cycle creatures like Deadshot Minotaur until you Violent Outburst into Living End. Storm—Desperate Ritual and Gitaxian Probe fuel Past in Flames into a lethal Grapeshot. Ad Nauseam—Angel's Grace plus Ad Nauseam let you draw your whole deck. For an aggro deck to flourish in Modern, it has to be fast. These decks are all very similar to combo decks in that they ignore much of what the opponent does, but they do play like traditional aggro enough to be classified as such. Wild Nacatl is essentially a Lava Spike on wheels here, and backs up the other one-drops and burn spells quite nicely. As is true of any deck with Boros Charm, this deck is just trying to get the opponent dead as soon as possible. Some draws win by turn three, but turn four is the most realistic number. Molten Rain can act as a pseudo Time Walk by setting the opponent back a turn, and the addition of those makes this deck significantly better against combo. Burn spells can kill creatures, and Molten Rain does mess up the opponent's plans. If all goes according to plan, this deck doesn't interact, but some games are messier than that. Even anti-burn sideboard cards such as Leyline of Sanctity or Timely Reinforcements don't just beat this deck, and the overwhelming amount of redundant pieces makes this deck very consistent. Burn is a touch slower than most combo decks, but gains in the resilience department. The next deck is one of the scariest in the format, and certainly one that demands a ton of sideboard space. Affinity doesn't even always have cards with that mechanic in the deck, though this particular list is sporting four Thoughtcasts. The deck obtains a critical mass of artifacts and uses them to power Mox Opals, Cranial Platings, Arcbound Ravagers, and Etched Champions. That gives you an explosive aggro deck that does way more unfair things than any other aggro deck in the format. Mox Opal is one of the easiest ways to get a turn-three kill, though Cranial Plating isn't far behind. Affinity's speed is one of its selling points. Affinity is good at getting past blockers and presenting many different threats, but it's not very interactive at all. Note that it has a great sideboard, due to having access to twelve sources of any color, and the interactivity does go up post-board. Affinity's greatest weakness is the sideboard. If other decks bring in three or four copies of Stony Silence, Shatterstorm, Shattering Spree, Vandalblast, or Ancient Grudge (and more), Affinity has a very hard time winning. The good news is that Affinity is so broken that it crushes most people who don't do this, but Affinity's best out against hate cards is to hope the opponent doesn't draw them. Control is a tricky beast to corner in Modern. Most control decks are capable of winning the game much faster than you'd expect, because it's hard to answer everything long-term. This is the new kid on the block, and the numbers on the Oath of the Gatewatch cards could easily change. It uses the interaction of Eye of Ugin and Eldrazi Temple with all the exciting new Eldrazi creatures, and can do things like cast a turn-two Thought-Knot Seer or turn-three Blight Herder. It also has an exile theme going on, which Thought-Knot Seer helps enable. This deck doesn't really kill by a certain turn. Given no opposition, it'd probably kill around turn six or so, but it realistically wins by killing or discarding all of the opponent's threats. 4/4s and 5/5s do end games, but not faster than any of the fast decks. If your control deck doesn't get a high interactivity rating, it's not really a control deck. This is what these decks do. With multiple ways to find Eye or Temple and four copies of each, this deck does a good job assembling the synergies it's got going. It also never runs out of gas, thanks to Eye, and has plenty of redundant pieces. Eldrazi is one of the most interesting new decks, and the lists are going to be all over the place until someone crushes enough opponents to make their list the default one. Snapcaster Mage is the power behind most control decks, and certainly all the blue ones. This deck uses delve to play cheap threats, and uses Snapcaster and various spells to deal with everything the opponent does. Some builds also use Jace, Vryn's Prodigy, and the inclusion of four Fulminator Mages in the main deck is an aggressive solution to Tron decks. A turn-two Tasigur, the Golden Fang can win the game rapidly, but like Eldrazi, this deck is more about dealing with threats than killing by a certain turn. Playing four Serum Visions, three Thought Scours, and four Snapcasters automatically makes a deck resilient. The draws with Grixis are very smooth, and the deck is good at finding the right mix of lands, answers, and threats. There's no one sideboard card that shuts this deck down, and there's no threat it can't answer. Jund/Abzan—A black-green-based control strategy that relies on hand disruption and removal plus Tarmogoyf. Lantern Control—A ridiculous concoction that uses Lantern of Insight and Ghoulcaller's Bell to control the opponent's draw steps. No, really, and it won a GP last year. Urzatron—It could be argued that this is a control deck instead of combo, I suppose. This look at Modern just scratched the surface, and I highly encourage you to check out all the other decks the format has to offer. The format has been shaken up by recent bans and by Oath of the Gatewatch, and now is a good time to get into it. Nobody fully knows what the metagame is going to look like in a couple weeks, so if you've got something sweet to try, the time is now. Hopefully we figure out something awesome for the Pro Tour—and who knows, it may just be one of the decks I wrote about today!